There is something just under the surface of these old suburbs. The feeling is peripheral, glimmering briefly in glances cast across cul-de-sacs, big-box stores, or out the windows of porchless houses. Such spaces are not only mundane and insubstantial but also vaguely malicious—big streets, narrow sidewalks, or often none at all. These are not places built for humans. At night, the streetlights are few, half burnt out. Walking between asphalt and lawn and the modest gravel gutter where they meet, your body is struck by the rushing wind of vehicles crashing past in the darkness. You cannot see anyone’s face past the headlights, or even the car itself—and after a while, maybe you imagine there isn’t one, it is just a motive force and an invisible mass shooting across the blackness from one island of dimly lit concrete to the next. The big-box store is indistinguishable from the warehouse, from the factory, from the hospital, from the rail yard or the abandoned mall sprawled out in the lowlands. And com- pared with these, the lights of people’s houses uphill are almost invisible, like embers fading to ash. When Ferguson was burning, the National Guard set up base camp in the parking lot of Target. Men armed with automatic weapons guarded the Ross Dress for Less. Beyond the border of the parking lot was nothing but humid darkness, a few porch lights like torches held above the black water of a swamp. The soldiers looked out into that darkness as if expecting something. This is what happens when the tension under the surface of the cul-de-sac breaks. Whatever the character of the coming conflict, it does not take place in the public square or in the shattered financial district. Instead, it happens at the fringe: the edge of the city proper, where population growth is fastest, infrastructure worst, poverty invisible or ignored, and the contradiction between the dead white utopia and the new proletarian reality at its breaking point. The suburb, rather than the central city or the “urban” slum, will prove itself among the most volatile sites of political unrest over the next several decades. For the same reason, these will be the places that hold the most potential to change the dreary trajectory of political organizing in the country. As the center collapses, both left and right will find the rapidly changing terrain of the U.S. suburb to be a key battlefield in future political conflict, rather than the well-trod urban districts so favored by activists. The suburb, rather than the central city or the “urban” slum, will prove itself among the most volatile sites of political unrest over the next several decades. In the American imaginary, however, “suburban” spaces are simultaneously the Eden of the white race and a Gomorrah narrowly escaped by the liberal urbanist. The exact same historical heritage of housing segregation and secure industrial employment that makes the postwar suburb the centerpiece of white nationalist mythology also makes it the very image of intolerant evil for upper-class whites, who pride themselves on the mild diversity of their “post-industrial” urban neighborhood viewed from the elevated floor-to- ceiling windows of coffin-shaped condominiums. Both viewpoints, however, are based on a mythic image of the American suburb. The data paint a different picture: More than 80 percent of the U.S. population live in cities, according to the U.S. census, but this number does not distinguish urban from suburban. According to one large national survey, how- ever, among respondents who were asked whether they lived in “urban,” “suburban,” or “rural” areas (with no further definition given), only some 26 percent said they lived in “urban” areas, slightly more than the 21 percent who characterized their location as “rural.” In con- trast, 53 percent claimed to live in a “suburban” neighborhood. At the same time, much of the population living in these neighborhoods do not match the mythic image of the suburbanite. By the time of the last census, the majority of poor people in American cities (some 16.4 million in 2011) lived in suburbs, where poverty grew more than twice as fast as in the city proper (64 percent between 2000 and 2011). Maybe the most salient fact of recent political unrest in the United States is this: Michael Brown lived and was murdered not in the “inner city” but in an American suburb. Similarly, as cities like Atlanta, Minneapolis, St. Paul, and Seattle have arisen as “new destinations” for international migrants, the location of immigrant settlements within such cities has also undergone a complete inversion. As early as the year 2000, just over half of all immigrants lived in suburbs. By 2013, the number had risen to 61 percent, and has continued to increase. In some cities, the trend far surpasses this figure: In Atlanta, 96 percent of the immigrant population already lived outside of the city as early as 2005. Even in cities with few immigrants, the racial demographics of the suburbs have often undergone a complete reversal. Ferguson is again a case in point—once a majority white suburb, it is now majority black. And this means that the geography of the police state and political violence more generally is itself shifting. Maybe the most salient fact of recent political unrest in the United States is this: Michael Brown lived and was murdered not in the “inner city” but in an American suburb. But not all suburbs are created equally. Before analyzing the broader dynamics that have shaped recent metropolitan growth in the United States, it will be helpful to sketch out a loose atlas of three broad types of suburb. I list them here in order of their potential for political volatility, beginning with the most stable. First, there are Outposts of the Elite. These can be subdivided into “liberal” and “conservative” variants. The peri-urban neighborhoods housing liberal elites include wealthier tech suburbs or high-end service and retirement centers—Silicon Valley is an obvious case, as are the “Silicon Forest” suburbs in Seattle and Portland, but many wealthy suburbs in the Los Angeles megalopolis fit this description, as do large parts of cities that are defined by their wealthy arts, entertainment, and retirement industries, such as Santa Fe. These areas still pride themselves on being outside of the city proper, but they are often far more diverse than their conservative counterparts, since they attract a number of high-income skilled migrants with more secure “specialty occupation” visas. Similar neighborhoods housing conservative elites tend to be exurban, almost entirely white, and more or less accord with the popular image of conservatism and suburban racial animus. Some of these areas are extremely wealthy—such as Town and Country outside St. Louis, which contains the highest income census tracts in Missouri—but others are simply high-income exurbs that still clothe them- selves in the illusion of “middle-class” identity. The latter are the type of exurb where people commute to the city to work as police, real- estate contractors, or managers and engineers in the many warehouses, factories, and ports located in the poorer “inner-ring” suburbs. Although more racially homogeneous than the suburbs inhabited by the liberal elite, these exurbs are also more socially heterogeneous, especially insofar as they border zones of rural poverty. This alliance between class fractions allows for such spaces to be portrayed as “white working class,” as more of a cultural signifier than a description of material status. In many senses, these are the people that liberal urbanites rely on to maintain order, managing unruly masses of workers, clearing the homeless from the streets, patrolling the newly gentrified districts, and overseeing the construction of new condos and tech headquarters. This creates an antagonism between the two fractions of elites, with the bottom rungs of this conservative, exurban population most attracted to far-right politics, seeing themselves as a class of warriors, sacrificing themselves to defend the ungrateful urban liberal from the threats beyond the city wall. It is no coincidence, then, that many of the police sup- pressing the protests in north Baton Rouge in 2016 came from a nearby white suburb, Livingston Parish, known for its KKK activity. Second, there are Surplus Cities. These suburbs are defined by segregation and racialization, housing a surplus population that exists in a state of latent unemployment. In a way, they are the mirror image of the white conservative exurb—almost equally segregated but in the opposite direction. Ferguson is the most obvious example, but most areas where the zone of “inner city” poverty has expanded beyond the bounds of “the city” fit the same description. These tend to be within Southwestern or Rust Belt cities, and their weak tax base means that local government is dependent on an array of fees and fines to function (or that it simply does not function, as in the “colonias” of the Rio Grande Valley). Many of those who live within these neighborhoods thereby experience class exploitation in the form of direct violence—by police, racist vigilantes, Immigration and Customs Enforcement (ICE), or criminal rackets—and onerous rents extracted by any- one with a modicum of power. In Ferguson, for instance, the city of 21,135 people had 32,975 arrest warrants issued for nonviolent crimes in 2013, the majority of which were driving violations, disproportionately allotted to black residents. Similar practices are on the rise across the United States, with bail, probation, fines, and court fees used to institute a widespread system of extra-tax, extra-wage extraction. The type of unrest seen in Ferguson, then, is likely only a preface to the next era of suburban riots. In Ferguson, . . . the city of 21,135 people had 32,975 arrest warrants issued for nonviolent crimes in 2013, . . . disproportionately allotted to black residents. But what distinguishes rioting in the suburbs from rioting in the cities, where similar acts of police murder occur regularly, is the relative scale of power. Many of these suburbs were originally built not for the poor but for the white middle class. They therefore have little of the architecture of control seen in places like New York—there are few surveillance cameras; streets are dark; narrow alleys and driveways give way to roadless fields or unlit, abandoned industrial sites; residents have easy access to vehicles, which become tools to escape or to amplify the energy of the pro- test. Maybe most important, they have relatively small police departments unprepared to contain outbreaks of unrest. Compare the fifty-or-so officers employed by the Ferguson Police Department, for instance, to the NYPD, one of the biggest standing armies in the world. A final type of suburb is the Logistics City, which sees much lower rates of unemployment, due to a concentration of industrial activity in the form of factories, fulfillment centers, ports, warehouses, rail yards, and massive facilities for waste management and food processing. Here, many of the above forms of exploitation are experienced alongside the barefaced misery of doing too much work for too little money. These suburbs are usually near freight nodes, and often extend along shipping corridors, composed of both the industrial zones housing key productive infrastructure and the working- class settlements abutting them. These include purely suburban places such as Shakopee, MN and Scott County south of it (both just beyond the Twin Cities), or the Kent Valley and SeaTac areas south of Seattle. But just as often, they are one part of a mega-urban zone that includes both cloisters of affluence and vast deserts of suburban poverty, as in much of the greater Los Angeles region stretching eastward into the Inland Empire, or Chicago’s southward sprawl, or Houston’s multidirectional explosion of a city. A similar phenomenon can be seen along industrial corridors like “Cancer Alley” in Louisiana, strung between Baton Rouge and New Orleans. The strategic importance of such places can- not be exaggerated. Some see a future for emancipatory politics in the organization of logistics workers into new social unions within a broader “worker’s movement.” Others have noted the increasing spatial convergence between our era’s constellation of brief-burning riots and suburban industrial infrastructure. Riots (and of course strikes) will begin to take place in or alongside the ports, warehouses, and factories that are integral to global production, greatly amplifying their threat in the eyes of the ruling class. The most obvious example of this has thus far been the various port shutdowns on the West Coast in 2011, affiliated with the Occupy movement. But in the future, such events will not require this sort of intentional political thrust and will, instead, be a simple fact of antipolice riots, for example, occurring in logistics cities and, thereby, blockading production. None of these suburbs exist in a vacuum, how- ever, and logistics cities in particular often aggregate around so-called “global cities.” The core of these metropolitan areas is a bright, visible summit in the world’s geography of production, aspired to by lower-lying cities. But despite their luster, these summits are in reality only the tip of a vast economic iceberg, the bulk of which lies in these massive logistics-factory complexes just beyond the walls of the palace— largely out of sight for banker-aristocrats, droll techies, and hipster “creatives,” all of whom laughably assume that it is their “intellectual labor” that keeps the global economy rolling. The heart of the economy, however, is not to be found in the arts district, the hollow halls of finance, or even the bland, discolored box- architecture filled with coders in cargo shorts. It is found, as always, in the fields, the factories, the ports and warehouses, and rail yards where goods are produced, processed, and distributed. Decades of economic restructuring, driven by persistent stagnation in industrial profits, have forced American cities into a zero-sum game. Despite the ever-present mythology of urbanism, espoused by tech elites extolling the virtues of the “creative class,” the reality is that success and failure in this game is largely deter- mined by the shape of global production. Over the last several decades, technical revolutions in industry (such as those afforded by digital technologies) have absorbed diminishing amounts of excess labor compared with the massive labor demand generated by the advent of electricity, rail technology, and aeronautics in previous centuries. Meanwhile, this increased efficiency has resulted in only a single, brief uptick of profit-ability in the 1990s. These technical changes were accompanied by the offshoring of many remaining labor-intensive factories to locations where costs are low and windfall profits can be made through super-exploitation. But by dis- aggregating production across globe-spanning supply chains, this process of restructuring has also necessitated that administration be aggregated in just a handful of key cities such as New York, Tokyo, Shanghai, and London. These are “global cities” in the truest sense, host to palatial financial districts, the cutting-edge of tech innovation and hordes of taxi-hailing minor executives tasked with oiling the wheels of the productive bureaucracy. The labor markets of such “global cities” are often bifurcated: with a minority of elites employed in the high-end services or high-tech production, which act as the area’s economic base, and a majority of common workers dependent on this base. The office of the financier is cleaned by the underpaid janitor; the white- badge Google employee eats for free, his food cooked by red-badge service workers who get none of the same benefits. The low-end service jobs that compose the bottom of this “dual labor market” have been one of the major pull factors for both domestic and international migrants. But as the central city has become increasingly expensive, those employed in the low-end services have been pushed farther and farther out to the urban fringe. At least part of the large migrant population (domestic and international) in the suburbs commutes into the city or into more affluent neighboring tech suburbs to staff the bottom rungs of the employment hierarchy. It is no accident that all the major hubs of tech and finance also just happen to be port cities or adjacent to massive inland shipping centers. But logistics cities are always present, if less visible, just outside the bounds of even the highest-tech, most service-oriented metropolis. The greater Los Angeles area, for instance, is the largest manufacturing hub in the United States, with industry stretching up from the port in Long Beach via the Alameda corridor into Los Angeles, then scattering eastward into the sprawling suburban Inland Empire. Those cities that have fared best in the last several decades have often been those able to retain larger shares of employment in the expanded industrial sector, including manufacturing, food processing, wholesale trade, transportation and warehousing, and various other jobs concentrated around seaports, airports, and Amazon- style fulfillment centers. It is no accident that all the major hubs of tech and finance also just happen to be port cities or adjacent to massive inland shipping centers. If the bulk of the economy lies below its summit, this also means that the “city” does not really stop at the border between “urban” and “suburban.” The distinction between the two has always been vague—the divide itself a matter of ideology rather than cartography. In general, suburban space in the United States now belongs to a larger global hinterland, defined by its position in the hierarchy of capitalist production. Local hierarchies are inset into worldwide supply chains defined by labor arbitrage. The dual labor market of a financial capital city such as New York is integrally linked to other hierarchies in places like Bangladesh. Economic division is set into divisions of greater scope and scale in a fractal geometry of exploitation. But a few divides are more central than others, and among the most important is that between the absolute administrative summits of the economy and everything below. While the palace is defined by its ability to appear “post- industrial” through rapacious rent-taking and vicious monopolies on finance, intellectual property, and state violence, the hinterland is an industrial space, its exact character determined by its proximity to the palace walls. Detroit’s rapid rate of demolition, absent infrastructure, and resurgence of local subsistence economies all put that city’s problems more and more on par with the problems faced by those living in rural poverty . . . . The zoning of the global economy takes shape in U.S. cities more or less as follows: What we think of as “suburbs” most often act as a near hinterland, where visible industry (food processing, waste management, manufacturing, warehousing, and numerous other logistical tasks) accretes just outside the sightline of the wealthy urbanite. By contrast, exurban and rural areas compose a far hinterland, where the supply chains narrow along thin strips of inter- state, river, or railroad. Spaces in the far hinter- land are often still industrial, but they are devoted to particularly messy or violent industries—agriculture, mining, waste disposal, incarceration. These areas are also dominated by the highest unemployment and poverty rates in the country. And in fact, the far hinterland is not an exclusively “rural” space in the traditional sense—it is defined by distance from accumulation, and therefore, the hollowed-out rust belt metropolis fits the description equally well. Detroit’s rapid rate of demolition, absent infrastructure, and resurgence of local subsistence economies all put that city’s problems more and more on par with the problems faced by those living in rural poverty, rather than with those challenges faced by the residents of last century’s densely populated “inner city” slums. In 2012, there was a strike at a factory in Kent, Washington just south of Seattle. The factory made wire, mostly for fencing supplied directly to a number of large agricultural distributors. Although the plant had been around since the postwar era, its workforce hardly resembled the mythic ideal of the suburban working class. Despite being unionized for decades, the work- ers’ wages had been decreasing relative to inflation for just as long. There were no real benefits, and retirement funds were paltry. It was common to work for a month straight during the high season, often including sixteen-hour days. The work was intense and exhausting, and the combination of long hours and old equipment meant that a number of workers had lost fingers to the wire-cutting machines. When this happened, they received a small lump sum payment (per finger) and only had the initial hospital visit covered by the company. In the factory, the blood was simply cleaned off of the machine, and a new worker was found to operate it. The workplace itself was hyper diverse, the older generation of white and black workers picketing alongside immigrants from Eastern Europe, Southeast Asia, and East Africa. Similarly, the manufacturing process was only one stage in a worldwide production chain. Many of the trucks that were stopped by the picket were short-haul runs, with containers taken directly off container ships in the ports of Seattle or Tacoma, loaded on the trucks and delivered straight into the factory’s warehouse building. The containers and their contents were manufactured in China, and shipped out through one of the mega-ports on the other side of the Pacific. The workers were not asking for much, and many were striking just for the sake of it, intending to quit afterward. When I asked a young Russian man what he would do after he quit, he just shrugged, sweat glistening on his arms, and signaled toward the many warehouses clustered around the slowly curving Green River. The sun was high, and Mount Rainier loomed above everything, a constant reminder of the valley’s violent genesis in fire and ice. “Maybe work at the Amazon fulfillment center,” he said. It paid less, but it would just be temporary, like anything else. Meanwhile, the picket continued over his shoulder, workers from all over the world walking in that endless circle, sweating and yelling somewhere in that vast industrial stretch between the city and the distant volcano. The survey cited here roughly matches up with the data the Census has recorded (the “subur- ban” and “urban” responses roughly adding up to the total “urban” population), but it was con- ducted by Trulia, a real-estate company, in 2014. A summary of the findings can be found here: Jed Kolko, “How Suburban Are Big American Cities?” FiveThirtyEight, May 21, 2015, available at https://fivethirtyeight.com/features/how-suburban-are-big-american-cities/. These numbers come from the Brooking Institute’s Confronting Suburban Poverty project, helmed by Elizabeth Kneebone and Alan Berube. Detailed data is available in the book of the same name, but summaries, additional case studies, and more updated data are available on the project’s website: https://www.brookings.edu/ book/confronting-suburban-poverty-in-america/. For more on this phenomenon, see the work of the Migration Policy Institute (cited below) as well as: Helen Marrow, New Destination Dreaming: Immigration, Race, and Legal Status in the Rural American South (Stanford: Stanford University Press, 2011). See Jill H. Wilson and Nicole Prchai Svajlenka, “Immigrants Continue to Disperse, with Fastest Growth in the Suburbs,” The Brookings Institute, October 29, 2014, available at https://www. brookings.edu/research/immigrants-continue- to-disperse-with-fastest-growth-in-the-suburbs/. Audrey Singer, Susan Hardwick, and Caroline Brettell, “Twenty-First Century Gateways: Immigrants in Suburban America,” Migration Policy Institute, April 30, 2008, available at https:// www.migrationpolicy.org/article/twenty-first-cen- tury-gateways-immigrants-suburban-america. Phil A. Neel, “New Ghettos Burning,” Ultra, August 27, 2014, available at http://www.ultra- com.org/project/new-ghettos-burning/. See “‘Open to Unorthodox Methods:’ An Interview on the Baton Rouge Uprising,” Rigole Rise, August 27, 2016, available at https://rigolerise.wordpress.com/. See “Misery and Debt,” Endnotes, no. 2, 2010, available at https://endnotes.org.uk/issues/2/en/ endnotes-misery-and-debt. On the surface, colonias seem to be rural in character. But in reality, many are integrally connected to the larger metropolitan areas of which they are a part. Danielle Zoe Rivera, “The Forgotten Americans: A Visual Exploration of Lower Rio Grande Valley Colonias,” Michigan Journal of Sustainability 2 (Fall 2014), avail- able at https://quod.lib.umich.edu/m/mjs/12333712.0002.010?view=text;rgn=main. See, for example, Joe Allen, “Logistics’ Two Fronts,” Jacobin, March 28, 2017, available at https://www.jacobinmag.com/2017/03/amazon- ups-organizing-unions-logistics-teamsters-united. I argue this in my forthcoming book, Hinterland, and a similar position is offered by Joshua Clover, Riot. Strike. Riot: The New Era of Uprisings (New York: Verso 2016). See the Industrial Production Index, as recorded by the Federal Reserve, available at https://fred. stlouisfed.org/series/INDPRO. For the best attempt at an adequately grounded theory of this process, see John Smith, Imperialism in the 21st Century: Globalization, Super-Exploitation and Capitalism’s Final Crisis (New York: Monthly Review Press, 2016). The body of theory attempting to explain these trends is called “Global City Literature,” its hallmark text being Saskia Sassen, The Global City: New York, London, Tokyo (Princeton: Princeton University Press, 2001). For one of the early papers defining and reviewing the concept, see Michael Reich, David M. Gordon, and Richard C. Edwards, “Dual Labor Markets: A Theory of Labor Market Segmentation” (Economics Department Faculty Publications, No. 3, University of Nebraska– Lincoln, 1973). See Michael J. Piore, Birds of Passage: Migrant Labor and Industrial Societies (Cambridge: Cambridge University Press, 1979). See Tiffany Hsu, “Los Angeles Is Largest Manufacturing Center in U.S., Government Says,” Los Angeles Times, September 1, 2014, available at http://www.latimes.com/business/la-fi-los-angeles-manufacturing-20140829-story.html; and Natalie Kitroeff, “California’s Inland Empire Reels after Losing Hundreds of Blue-Collar Jobs,” Los Angeles Times, August 29, 2016, available at http:// www.latimes.com/business/la-fi-ashley-furnit ure-inland-empire-20160829-snap-story.html. 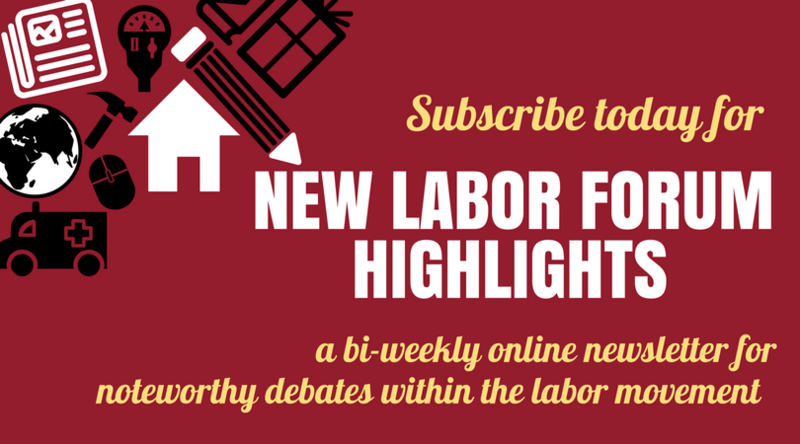 For the broad trends, see Joe Allen, “Studying Logistics,” Jacobin, February 12, 2015, avail- able at https://www.jacobinmag.com/2015/02/ logistics-industry-organizing-labor.